Bugging Out – in a Flying Car? The Maverick Flying Car offers a novel way to possibly make your way to your retreat. One of the greatest concerns for most preppers is how to get acceptably close to a ‘five nines’ (ie 99.999%) certainty that, in an extreme situation, they can be guaranteed the ability to safely and successfully travel from their normal residence to their retreat. We’ve discussed the subject from several perspectives in other articles (here’s the category listing for our articles about bugging out) and for people who are choosing to participate in the Code Green community, we are preparing a ‘Halfway House‘ to make it easier to travel to our retreat location. But the concern unavoidably remains. As preppers, we necessarily need to prudently consider not only best case scenarios, but also scenarios moving closer and closer to the ultimate worst case, and to establish a level of preparedness and response that we feel represents the best compromise, for each of us, between likely risks, prioritized preparations and – the ultimate constraint for many of us – associated costs. Here’s a novel new concept that we offer as much for thought as for serious consideration, but which might prove to be of practical interest to some people – the Maverick flying car. This is one of the more practical car/plane combinations that we’ve seen. We’ve been following the concept of flying cars for decades, and it is a subject marked primarily by hype and disappointment – by extravagant promises (and even more extravagant associated costs of ownership) and subsequent failures to deliver and failed ventures. But the Maverick flying car seems to actually make good on its promises, and may offer a practical solution for people who feel unable to rely on road based travel to their retreat, but who don’t wish to commit to the substantial cost and additional complicating factors of a fully aviation based method of travel. The Maverick is at its best on the road with, among other things, a top speed in the realm of 100 mph and a 0-60 time of 3.9 seconds, as well as some off-road capabilities too which could be helpful if needing to take marginal alternate routes. It offers a generous 450 mile range, more or less, based on a 30 mpg fuel consumption. If you drove it carefully on sealed roads at steady speeds, we are certain you’d get appreciably improved range. If you face obstacles or problems on the road, however, you need only 100 yards to take-off and get airborne (and subsequently you can land in a similarly short distance). Note that these distances assume no immediate vertical obstacles – if there was a cliff face immediately at the end of the 100 yd take-off distance you’d have a problem! Note also these vehicles presumably have some weather limitations in terms of the amount of wind and cross wind that can be present to allow them to safely take off and land. And, with an open cab, you’d want to be sure to be bundled up very warmly before setting off on your journey, especially in winter time. The vehicle has a greatly reduced range when airborne – in theory about 120 miles. This would be insufficient for most bugging out purposes, but needs to be considered from two perspectives. The first perspective is to appreciate that the vehicle is primarily a road vehicle. You would transition to flight only to bypass obstacles on your path – for example, unplowed roads impassable due to snow, bridges that had fallen, trees blocking the road, or traffic jams. Maybe you’d actually be able to go all the way to your retreat without needing to take-off at all. The second perspective is to understand that the stated range – three hours flying time at a cruising speed of 40 mph – assumes a normal weight load on the craft. There are two strategies to greatly increase the vehicle’s flying range. The first is simply to overload the vehicle beyond its officially rated capacity. Its normal certification is for a maximum gross weight of 1320 lbs, but if you fill out paperwork and pay a fee, the FAA will allow the vehicle to operate with a higher maximum gross weight of 1430 lbs. That extra 110 lbs could be in the form of extra petrol. The weight of petrol varies with its temperature and specific formulation, but as a rule of thumb, assume 6.25lbs per gallon of petrol, and so 110 lbs equates to 17.5 gallons (assuming you don’t need extra containers) which would give you another 140 airborne miles or 525 road miles, or a mix of both. Indeed, you can overload the vehicle more than that. The manufacturer has tested the vehicle at 1500 lbs – a further 70 lbs of weight or 11.2 gallons of gas, giving still more range (90 miles of flight, 170 miles on roads). There’s another possibility too. Instead of driving/flying the vehicle with a partner, fly it solo. The weight that would have been your companion can be fuel instead. So, one way or another, it seems realistic to expect something in excess of a 750 miles range if driven on the road, and each mile of flight would subtract almost 4 miles from the road range – for example, you could fly 50 miles and drive 560 miles, giving you more than 600 miles of combined air/ground travel. One last thing about range. Remember that when you’re flying, you can travel ‘as the crow flies’, in a straight line. This can be a much more direct path than if you are having to follow every curve and twist and turn on a surface road. 100 miles in a straight line by air is considerably more than 100 miles on the ground. Our retreat can only be useful to us if we can be sure of getting there. Depending on the type of situation that has triggered your decision to ‘bug out’ and to move to your retreat, your normal travel experience may become more challenging. Indeed, even in normal times, if your route involves mountain passes that can sometimes be closed due to heavy snowfalls in the winter, you may occasionally have problems getting where you need to go. If the route to your retreat involves a tricky mountain pass in the winter, and/or possibly a major city that you wanted to be able to detour, this ‘mixed mode’ method of bugging out might be ideal and give you the certainty and reassurance you need. 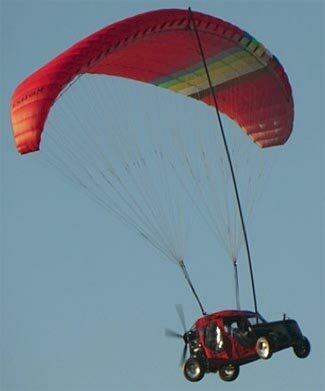 The Maverick ‘flying car’ currently sells for $94,000. We’ve not seen or flown one, and this is not an endorsement, merely an informational article – you’d need to do your own further research to see if they represent a practical concept for you to consider. More details on their website and here’s a link to a detailed six page fact sheet. The FAA has even created a special category of pilot license that is easier to qualify for to enable you to lawfully fly these types of craft. Community Mutual Defense Pacts – Always Essential; But Only Sometimes Feasible What Calibers of Guns and Ammo Should You Own?